So you want to be an opera singer. How do you fulfill your dream? What kind of work is required and what should you look for? I find it rather difficult to separate the two categories of “aspiring singer” and “established singer”, as it truly is a continuum of quality education that is needed. No single four year program or graduate program can produce a totally polished, ready-to perform professional singer. But here are six crucial elements to keep in mind along the training path, no matter what the level of expertise of the singer. Find a great teacher who works for you. This may not be the teacher that famous singer X was studying with at the time of “sudden fame”. Nor the most politically correct teacher. Choosing a teacher is one of the most crucial elements of a career. Know thy technique! You are the one in charge of your technique. If you don’t fully know and understand your voice and all the technical components, even the greatest teacher in the world won’t be able to make you successful. To find this person in your development is both important and difficult. Do not run your finger down the list of voice teachers at a university and find one with a charming foreign name. Do your homework! 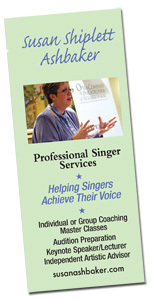 Prior to college, locate schools known for the quality of their voice teachers. Talk to other singers both young and old. Filter through the information and make a decision based on what your needs are. Networking is a tool for life. Start now! Know something about your teachers before you study with them. Are they performers? Were they performers? If no to either question, find out why. Know the students of the teachers and talk to them. Ask questions of the teacher. Don’t be afraid to continue the search for a voice teacher if your are mismatched with someone. You only have one set of vocal cords. Protect them. Love them. Learn how to use and preserve them. Try to stay unentangled from the web of co-dependence upon your voice teacher. A healthy relationship fosters dialogue; the ability to question and seek out. Co-dependence keeps you mute and fearful. Learn all you can. If something doesn’t feel right, question it. I repeat, you only have one set of vocal cords! After college and/or post training programs, the dilemmas are the same. Hopefully, in the process you’ve hooked up with a teacher who truly works for you. One whom you trust and who has helped you build a sound, sure-fire technique. Without that, no sense moving on in your career. Without a technique, you won’t have one no matter how well you’ve done the other “stuff”. Diction is to language what the C-major scale is to an opera. It’s part of the foundation, but useless without many other components. Too often classes or programs focus only on “pronouncing it correctly.” I can tell you that if your languages aren’t sufficient to convince a theater packed with 3,000 or more people that you are authentically Italian (French or German), you’ve missed the boat. And trying to catch up will take a lot of time. You must be able to communicate to your audience and your fellow cast members in Italian or French (often Spanish, Russian, Czech or English). Music is a great communication tool! Language is a great communication tool too! Opera requires both. Diction alone doesn’t cut it. If I were starting out as a freshman I’d get a major in voice with a second major in a language (while studying 2 other languages). For example, take four years of Italian, concurrently with two years of German and two years of French. You will graduate with a real handle on one language and a clear understanding of the two others. Do “junior year abroad”. Find in-country experience (classes, travel, etc.). See foreign films. Read a novel or newspaper in another language. Keep this up after your college or training programs so that by the time you’re 30 years old, you are a polyglot. You will understand the nuances of language and open up a wonderful world for yourself. Now you’re ready to communicate with thousands of people in a sold-out theater and convince them that you are authentic. Your recits can have a natural shape to the sentences. The long flowing phrases work because you understand where the text is taking you as well as the shape of the musical line. Of course, you can pay a great language coach $60-$100 per hour to spoon feed you every line and work incessantly with you to get that “authentic” bend to the language. You could spend $5000-$10,000 on an opera and you still wouldn’t really know what you’re doing. Don’t think I’m trying to put language coaches out of business–au contraire! What a joy it would be for a language coach to spend a few hours with someone who knew the territory; who was familiar with the ballpark and only needed some pointers instead of needing to be shown where the pitcher’s mound is each and every time. Diction just doesn’t cut it. If your current curriculum doesn’t accommodate this, find a training ground where this is possible. Be creative; make a program for yourself (private tutors, Berlitz courses), or find a different place to study. Don’t wait until you’re perfect to perform. The stages would be empty. Pick a college, post college or training program where performance is a routine part of the course of study. One hour on the stage in a real performance is worth 100 hours being told about it. Any stage experience counts. Any role,no matter the size, is a course of study in and of itself. This is true even if, as a young singer, you are a super and don’t open your mouth. If your post college or training program insists you sing in the chorus………. don’t bristle! Experience in a chorus can be a great thing. You can learn what it is like to be on stage in costume and makeup with direction to follow. You can learn a lot (repeat, a lot), by being five feet away from an established artist and seeing what they do in rehearsals and performance time after time. Ah, she drops out these four measures in the ensemble when turned upstage. Oh, look how he stands when he sings that high note! Hmm, famous singer X checks all her props before each performance. Why do these 2 singers “mark” so differently? Whether or not performance experiences are part of your curriculum, create opportunities for yourself. Put together recitals, programs of opera arias and duets or opera scenes. Then take it on the road to churches, synagogues, malls, assisted living and nursing homes, hospitals, schools and after-school programs. And shame on you if you insist on being paid. From 18 to 30 years of age, there is a lot of “dues paying”. So what, if for a few years, you sing your heart out, learn your craft and earn no money. The experience you gain is invaluable. Yes, I can sing at 9 am. No, not at 7 am unless I go to bed early and get up at 4 am. Yes, I can sing on no sleep but I lose my high notes when I am that tired. Yes, when I’m preoccupied by seeing an audience in front of me I can still perform, but it is not my best. How can I learn to focus better and not lose my concentration. No, I can’t sing my best with a piano that is missing some notes and is out of tune to boot. But I still can be expressive and have something to say. Yes, I need to warm up each and every time. Here’s what works best. Truthfully, these experiences that you create for yourself won’t convince me you’re ready to tackle a leading role at the Opera Company of Philadelphia. But, you will learn your trade and have valuable insights as to how to be on a stage. It’s always fascinating during production week at OCP . The minute the singers step foot on stage after weeks in the rehearsal hall, they begin a series of ”tests” to learn about the stage and the house. How and where does my sound come back to me? Is there a delay in hearing the orchestra when I’m on stage? They know what to do from experience. And no two singers go through the same routine. Like technique, it is something personal to you and to your needs. You will need a great coach (or coaches) for the rest of your life. You should find someone who can spoon-feed you a traditional La bohème for the time that you’re hired at the last minute to replace a person and have only two days to prepare. That someone should know the repertoire, performance standards and traditions. BUT you must also find someone who will help you discover your own artistry and sense of musicality. A coach whose ears are truly splendid and can hear not only intonation but the more subtle things. Someone who can help you with color, language, style and interpretation. I find it quite boring to hear a singer, no matter how great the technique and voice, who does a perfect imitation of the coach, (or a perfect imitation of any other singer, for that matter). Have something to say. Learn how to say it. It’s nice to have a coach tell you great stuff about your voice and your singing. But know the difference between smoke and substance. I happen to believe that honey works better than vinegar, but I am always honest. It would be a shame not to be honest. But a good coach should build you up, not tear your down, even when there is difficult work to be done. I wish I had known what I do now when I was taking classes in college. The more you know the more you realize how much is still left unexplored. Take classes, world history as well as music, art and opera history and literature courses in all languages. There’s a lot you’ll need to know. How does one stand as Cherubino and why? What was the life of a demi-monde like? How do famous singers from the 1920’s or 1950’s sound in a live recording? What happens to the Count and Countess after “”corriam tutti? Read the original sources of any opera based on existing literature. Take literature classes to learn how to read and understand. Study paintings and fashion from the various time periods. How you walk and move is often determined by what you wear on top as well as beneath. How will you feel with a wig piled so high, plus a hat. Take an art history class. Listen to pirated or live recordings. Anyone can sound good these days with the technology in the sound studio. The real test is in a live performance. Attend operas, ballets, musicals, plays, orchestra and solo concerts. Learn how to perform from the performers. Take classes in ballroom dancing, fencing, ballet, movement, stage combat, acting; anything that will give you experience that supports what you’ll need for staging as an opera singer. If you’re a mezzo with aspirations of singing Carmen, learn to play the castanets and take a class or two in Spanish dance. If you’re a baritone, you’ll probably wear a cape in many roles. Learn how to deal with all that material now. If all this sounds like drudgery, you’re in the wrong profession. What an exciting prospect, this course of study. So what if your bachelor’s degree takes five or six years and a masters an additional three. You’ll still only be 25 or 26 years old. Lay your foundation now. Make sure it is firm and sturdy. If you become a successful singer you’re liable to have to learn a new role while performing something else, probably in an area where you have no access to your teachers and coaches. Be sure each role doesn’t require reinventing the wheel. Cramming to catch up is no way to win in this career. One final component I am compelled to include is auditioning. Do not audition for me as a way to practice your auditioning. It may be the only chance you’ll get from me. Many cities offer classes in “how to audition”. Many schools do, too. Hone that part of your craft carefully because when you hit the audition circuit, you’re telling us you’re ready. Practice auditioning at school, or grab ten friends who are singers and “audition” for each other. Ask for feedback and help each other. Your weekly studio session is a form of auditioning. Ask the professor to take it a step further by video-taping your audition with one-on-one critiquing afterwards. Or have your studio session in a theater or a big hall on campus. Or ask a professional to come give a series of classes on auditioning. The classes should be interactive, where singers get feedback and pointers. If you want a career in opera, empower yourself to make it happen. And hold on for an exciting ride. There is never a dull moment! Good luck!